I was surprised by the excellence of this obscure album. 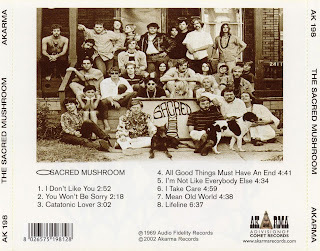 The band Sacred Mushroom hailed from Cincinnati Ohio. This album was originally released in 1969.
who later joined country-rockers Pure Prairie League. The music on this disk sounds nothing like country rock. 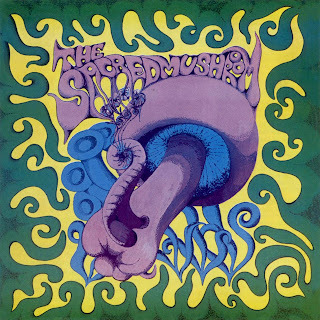 The music is instead great heavy blues from the late sixties. Larry Goshorn's guitar work while not overly fast or flashy shines throughout the disk. heavy blues/psych band Cream. Larry's brother Danny handles the lead vocals on the set. Songs like "I Don't Like You" and "Lifeline" contain great late sixties guitar playing. "Mean Old World" popularized by blues harmonica expert Little Walter. Unfortunately this was to be the band's only release. The approximately 34 minutes of music on this set shows great promise. Highly recommended for collectors of sixties heavy blues/rock.